11 Feb Collect a 4⭐ Sentinel Savage Reaper GUARANTEED in the Lord of Light! Conquer the Lord of Light to earn Savage Reaper AND Lilith Soul Fragments! Earn Savage Reaper Soul Fragments in the Lord of Light Dungeons from February 11th to February 14th at 4pm PT! Each Lord of Light battle has a chance of dropping 5, 10 or if you’re lucky, 50 fragments! 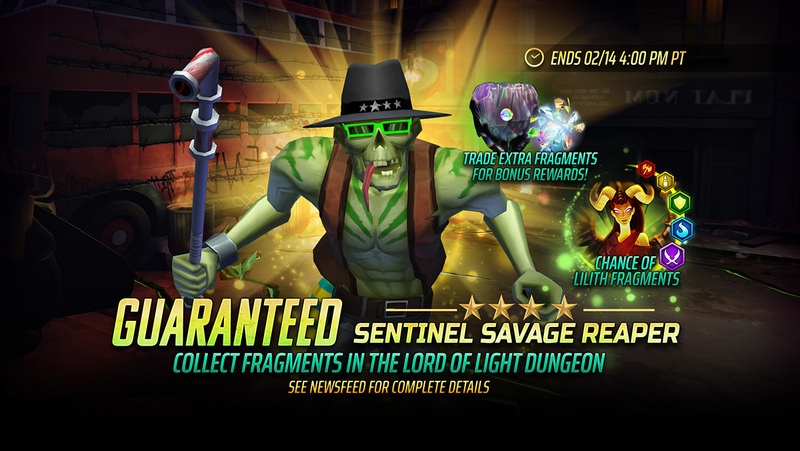 Collect 200 Fragments and you can redeem them in the Book of Souls’ Fragments screen for your very own 4⭐Sentinel Savage Reaper. This team enhancer gains 2 random golden effects at the start of battle and has the ability to steal golden shield effects from the enemy and grant them to his entire team! His power skill can also wreak havoc on enemy teams by inflicting Bloodlust and Bleed on the enemy for the duration of battle, and then granting an Extra Turn to self and a target ally. We’ve placed a free pack of 10 Savage Reaper Soul Fragments in the Store to get you started! SPECIAL EVENT ADDITION: Trade extra Savage Reaper Fragments for additional rewards in the Special Store! 500 Savage Reaper Soul Fragments will get you 50 Talisman Soul Fragments, whereas 100 Savage Reaper Soul Fragments will get you 1 Cosmic Evo Rune! 🎉Collect Lilith Soul Fragments! These special Fragments have a chance of dropping from all floors of the Lord of Light dungeons during this week’s Sentinel Savage Reaper event! Lilith Soul Fragments are a recurring fragment that is periodically featured in events. You may need to collect these fragments over multiple events in order to have enough to redeem a soul. This Soul will guarantee one of the five classes of Lilith, in addition to granting Frontier Coins (similar to the Trooper and Eternity Souls).